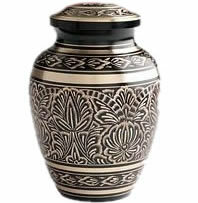 Includes Memorial Marker, Foundation, Lovely Vase and more! 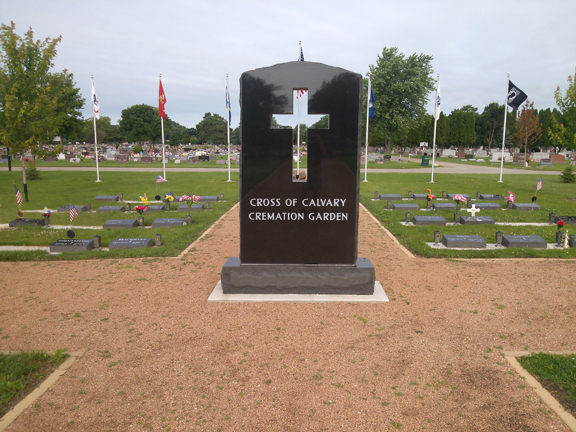 With the approval of the Board of Associates our Cross of Calvary Cremation Garden was started in the spring of 2009. In the summer of 2009 we added a beautiful 10-foot black granite cross memorial marker to enhance the garden. The cross memorial read "Cross of Calvary Cremation Garden" and can be read from County Trunk V.
Later that summer we added five black granite benches for those visiting a loved one, and anyone wishing to donate a bench and have their loved one's name inscribed on the bench may do so. In spring of 2010 we planted six trees to add to our lovely garden. Mrs. Joann Sabel planted flowers at the foot of the Cross of Calvary Cremation Garden walkaway. This year we are proud to say we honored all veterans of all military service who are buried in Calvary Cemetery with the flags and the poles. Other improvements were installing lamp posts, widening the road, adding lanscaping, pavers and gravel to the cross walkway. Many families who have a military loved one here made donations to help pay for the military flags and poles. We are very thankful for their help in this matter. We hear many wonderful comments from those who view the new area from County V as they drive by. They tell us how beautiful this area is now, since it used to be the location of a very old garage.